K-Selected is pleased to present an abridged (shortened) version Pierpont’s “Wind Turbine Syndrome” book in various non-English languages. You are welcome to download these, print them off, circulate them at will, hand them out, and post them on whatever websites you choose. They are a gift. What you will be reading is basically Chapter 4 (“Report for Non-Clinicians”) of the full-length English book, with several new pages added. 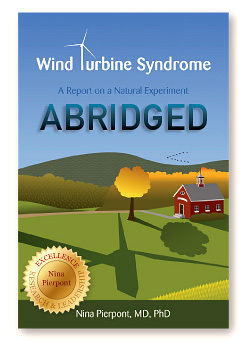 Thus making “Wind Turbine Syndrome: Abridged” a complete book in its own right. We sought out native speakers with creditable translating credentials. These people agreed to translate the book free of charge—as a gift to their countrymen. We invite you to make a donation to these public-spirited individuals, showing your appreciation (it took them months). Whatever money you donate goes to the translator, not K-Selected Books or Nina Pierpont.